William Byrd Ave Verum Corpus. To come to a programme of Saint-Saëns and Benjamin Britten therefore is both enjoyable and unusual. 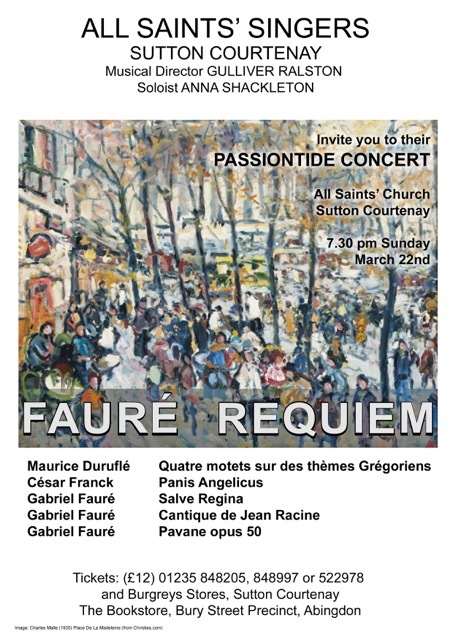 The inclusion of the harp and violin ‘Fantasie’ balanced the evening beautifully and created a welcome opportunity to reflect on the sheer diversity of Saint-Saëns’ music. What a find this young and talented violinist Elizabeth Nurse is! 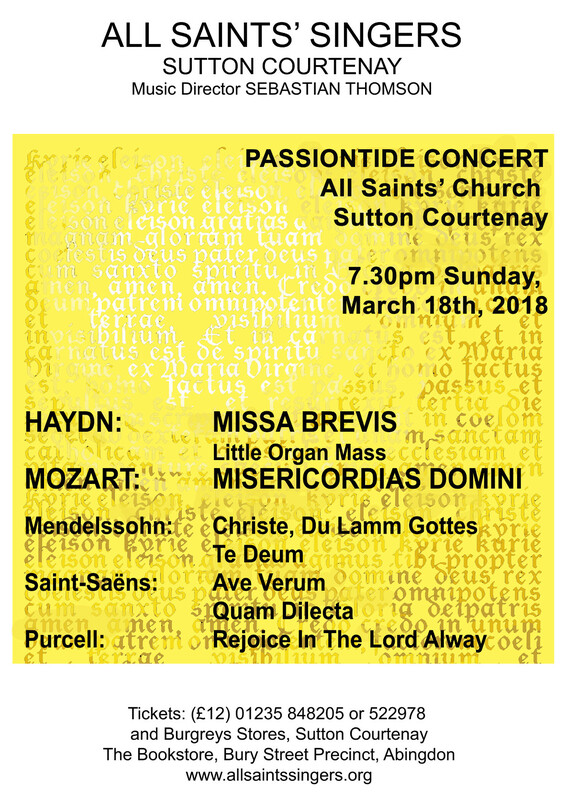 The opening two unaccompanied pieces were well rehearsed and whilst ‘Ave Verum’ is sung frequently the adjoining selection of Rameau’s hymn of lament was an unusual and inspired choice. 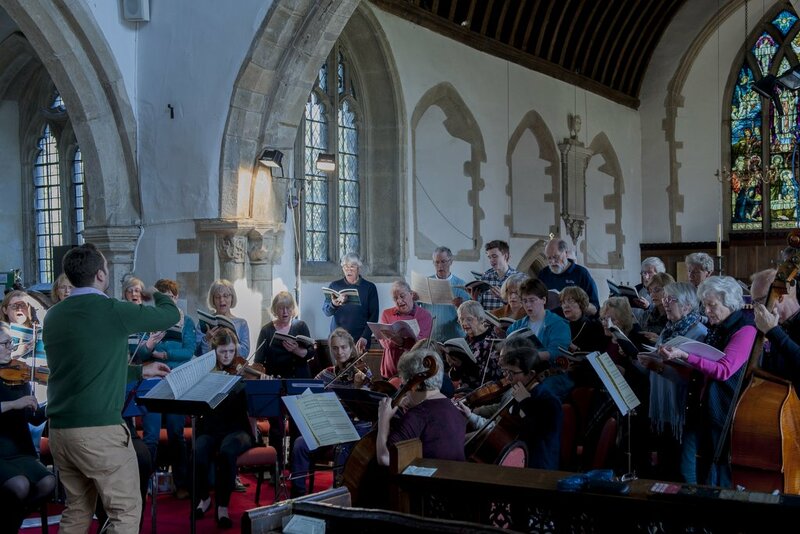 The choir gave both of these pieces a sense of timing and delivery which started the evening well. 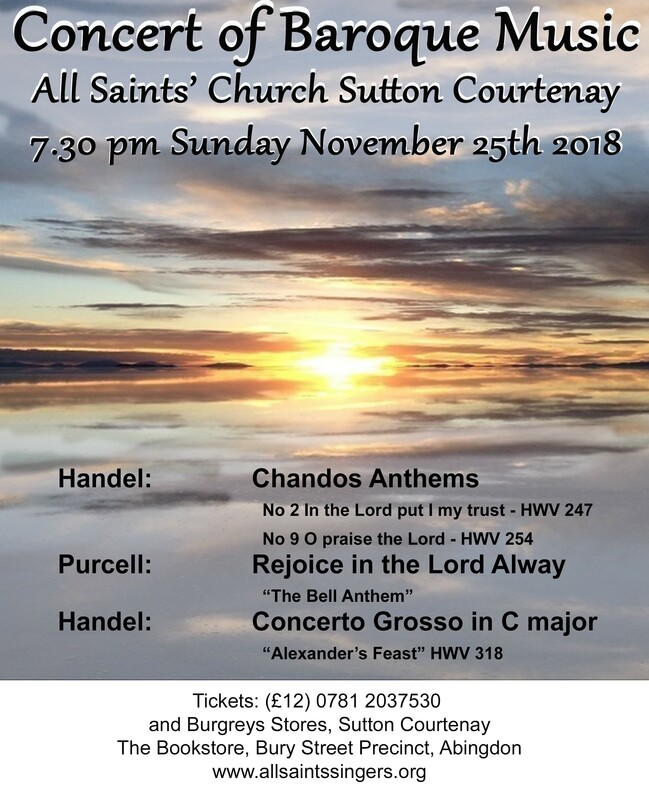 The ‘Christmas Oratorio’ was delightful, the soloists here were well balanced and sung beautifully, with the choir once again well-rehearsed and singing with a sensitivity, especially in the ‘Gloria Patri’, that I found quite moving. The work was new to me, and many in the audience also, and one I should like to hear again. Britten’s ‘Ceremony of Carols’ I have heard many times before and usually with just treble voices, so it was a great pleasure and surprise to hear the lower registers join in with this arrangement. No doubt there has been much discussion on how to pronounce middle English but my view is that if one sings loudly and enthusiastically enough then nothing is lost in the interpretation, and I did indeed feel “Wolcum.” The icy coldness of the interlude had the audience spellbound and surprisingly breathless with concentration (well done Anneke Hodnett whose playing throughout the evening was to a very high standard) and the whole work was delivered by choir and two soloists to my complete enjoyment. 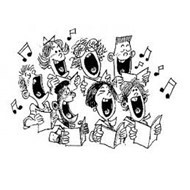 Thank you, All Saints’ Singers for the concert, the mulled wine and the minced pie. I shall come again! To begin the second half of the programme, it was a bonus to have our new orchestral leader Elizabeth Nurse joining the harpist Anneke Hodnett in a wonderful performance of Saint-Saen’s beautiful “Fantaisie”. 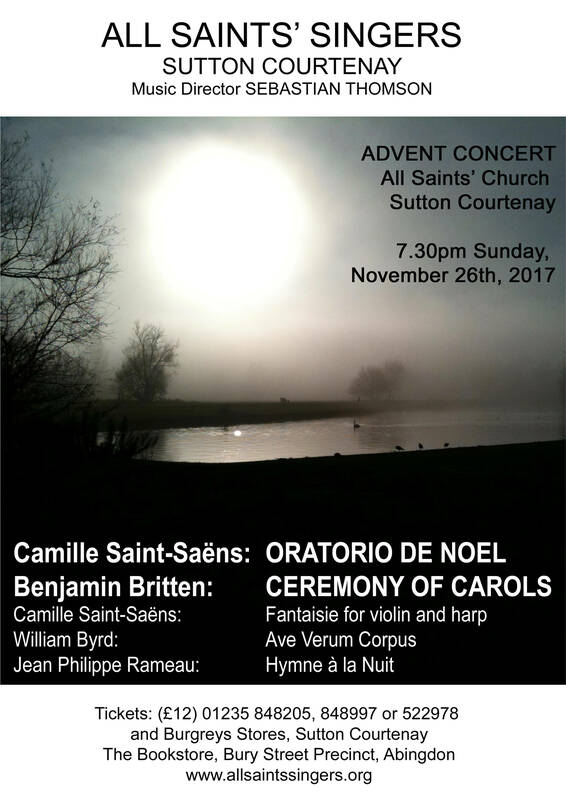 Inevitably, Britten’s “Ceremony of Carols” provided the climax to the concert; here the choir sang with accuracy and understanding, employing subtly contrasted dynamics. Again, the presence of a dedicated harpist must have given them that extra incentive to excel. 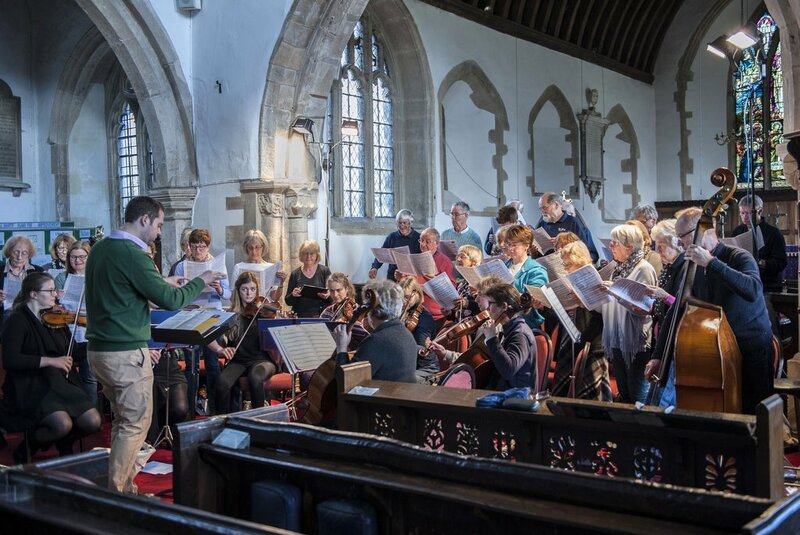 Although one might say that, in this concert, the choir did not have as major a role as might normally be the case, their contribution was always well prepared and carefully presented. Altogether a most enjoyable occasion, a view obviously shared by the larger than ever audience. I do hope Sebastian Thomson will stay with us! Sebastian has certainly made his mark as last night’s concert clearly showed and amply demonstrated his ability to inspire a high level of musicianship in singers and players alike.. 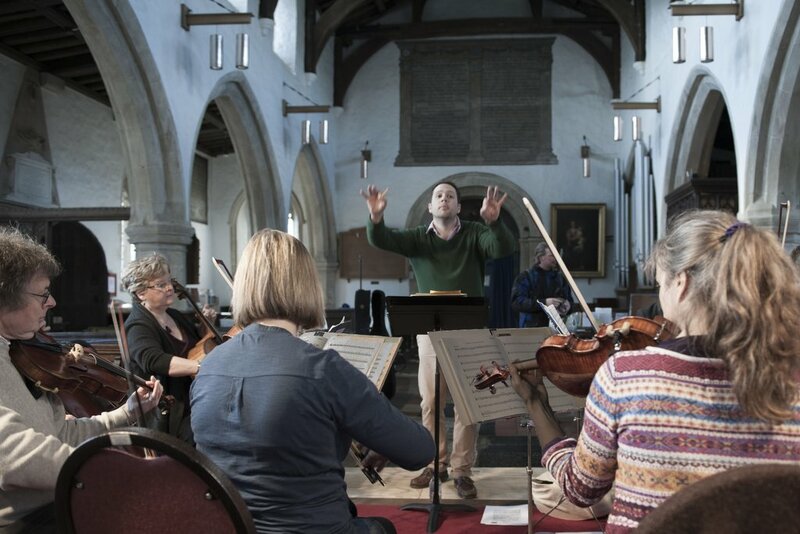 The opening Purcell work quickly revealed what a fine orchestra we now have and the soloists were entirely at one with the authentic style they established in the opening prelude. 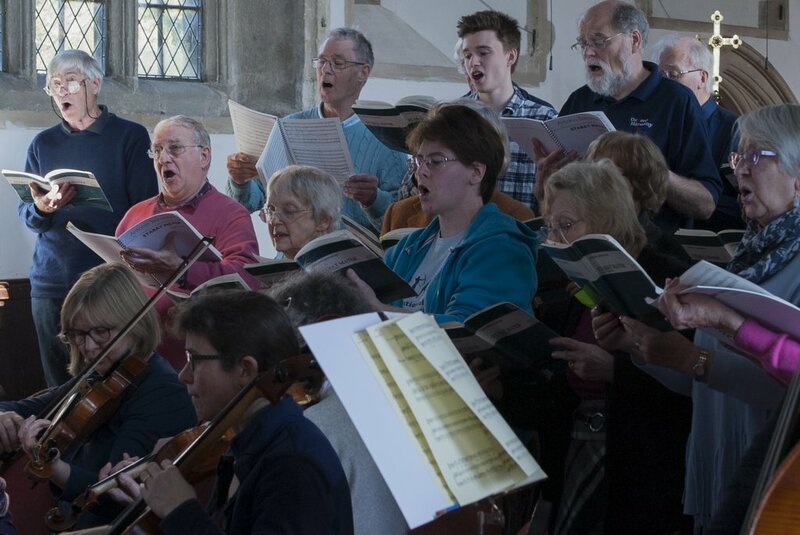 The choir’s confidence and quality was particularly evident when singing the beautiful but challenging unaccompanied six-part motet by Rheinberger. Bach’s Brandenburg Concerto No 3 was a brilliant and stylish performance that I found positively stunning! 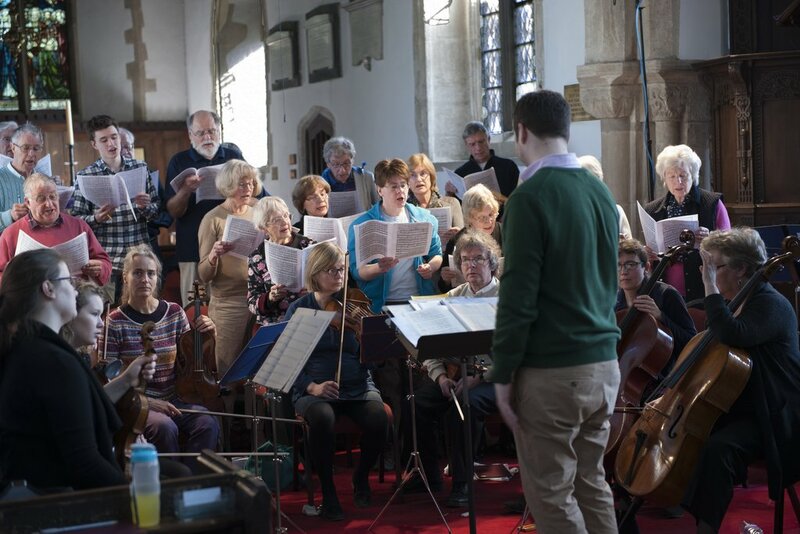 The verse anthem that completed the first part of the programme again demonstrated an inspired appreciation of Purcell’s wonderful music. 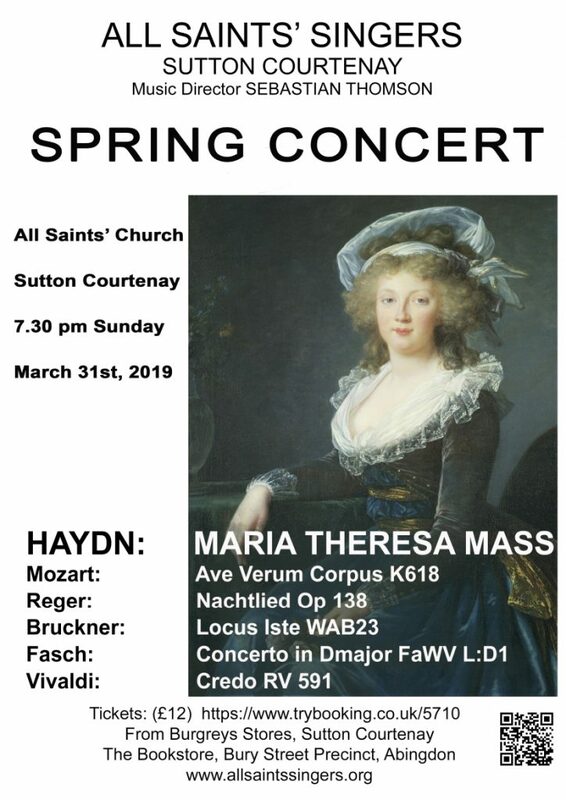 Penelope Appleyard’s beautiful singing of Vivaldi’s “Nulla in pax sincera” provided a perfect introduction to the “Stabat Mater” which made a great impression upon me. Great pains had been taken to express the utter devastation experienced by the Virgin Mary and the gradual transition to the inner feelings of the present day participant. Suitable restraint was shown where appropriate but, as in the “Virgo virginium”, the chorus were able to provide some sparkle as necessary. The soloists’ contributions were sensitively offered and well performed. 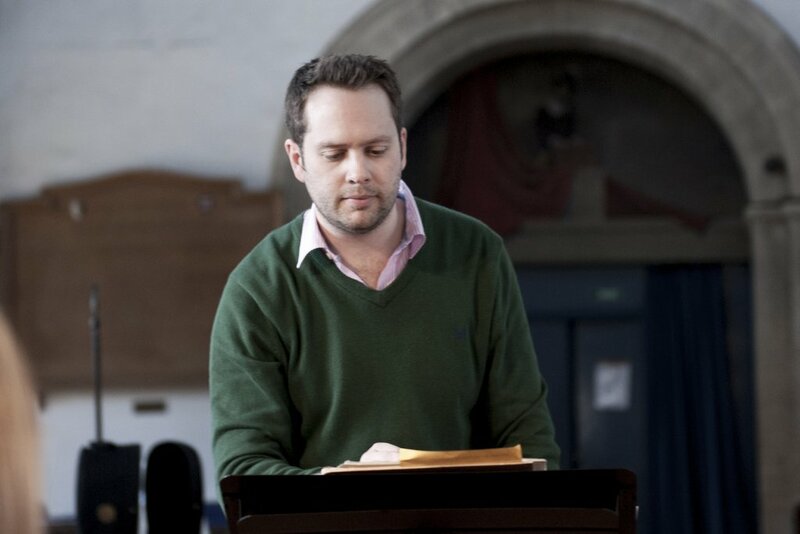 Despite the very solemn nature of the work the performance offered ideal preparation for approaching Passiontide. to say thank you for last week’s concert. 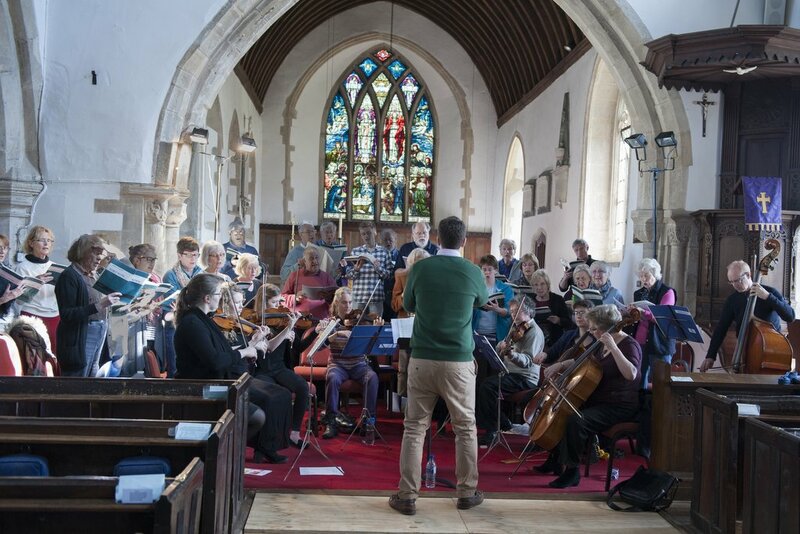 It was lovely to be back with you all again in Sutton Courtenay and to sing such an interesting array of music. The choir and orchestra were fantastic – so please pass on my thanks and admiration. I was very kindly given a ticket to your most recent concert and to which I reluctantly went, but felt a duty to attend and support the singer who insisted I came. How wrong can I be? 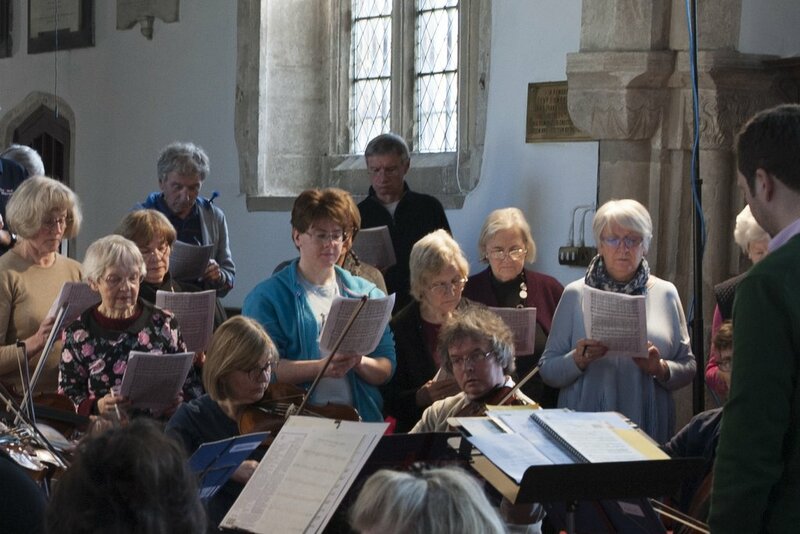 The delightful setting of All Saints Church created just the right atmosphere, for both the choir and audience. 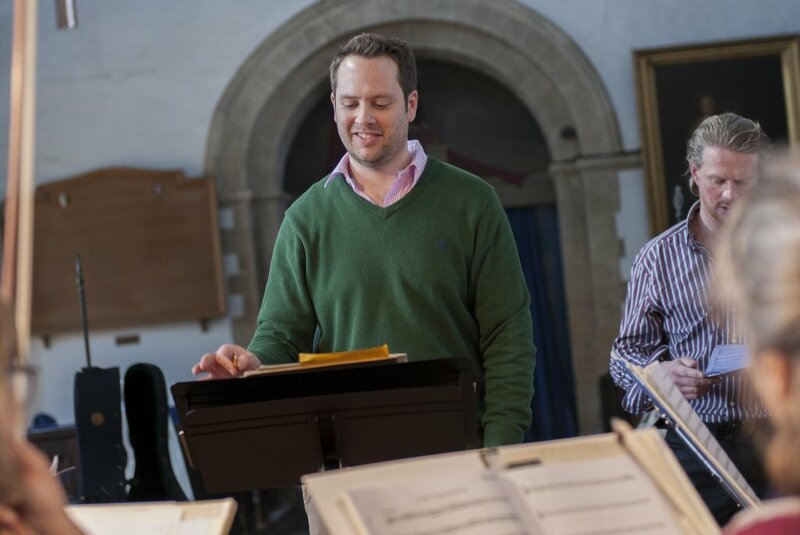 The first Purcell work began in a joyful and energetic way as to easily portray the name “Bell Anthem”. What a great start; but to listen spellbound to the choir unaccompanied singing for the next two works, “Thou knowest Lord “and “Abendlied” was pure joy. Of course after such mesmerising singing it was impossible to applaud but boy, did I want to! As if this wasn’t enough the orchestra playing Brandenburg 3 was pure delight. The very accomplished leader Elizabeth Nurse is a real find for you and she led the ensemble with authority and stylish virtuosity. I also enjoyed the somewhat operatic “O sing unto the Lord” to end the first half. 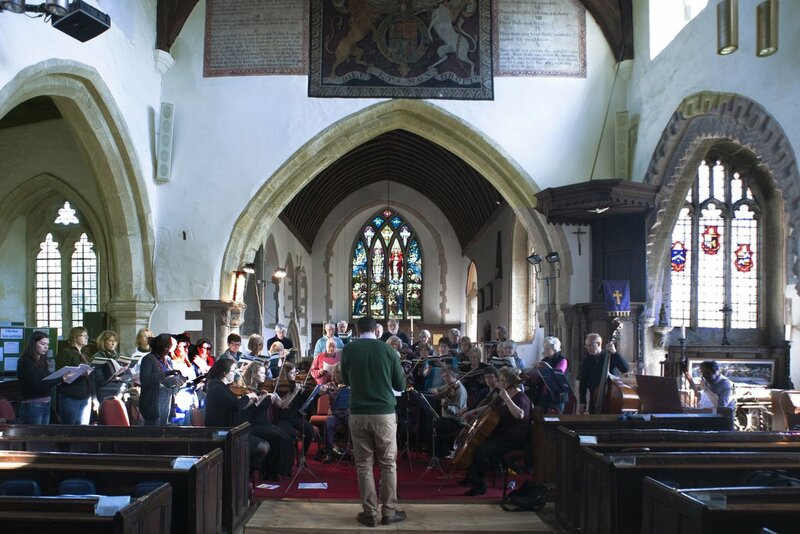 The wonderful setting of “Nulla in Mundo Pax”, was so deeply moving, sung brilliantly by Penelope Appleyard, and sensitively accompanied by the strings. Where do you find these wonderful musicians? The translation is “there is no peace in the world” How wrong can you be after hearing this? 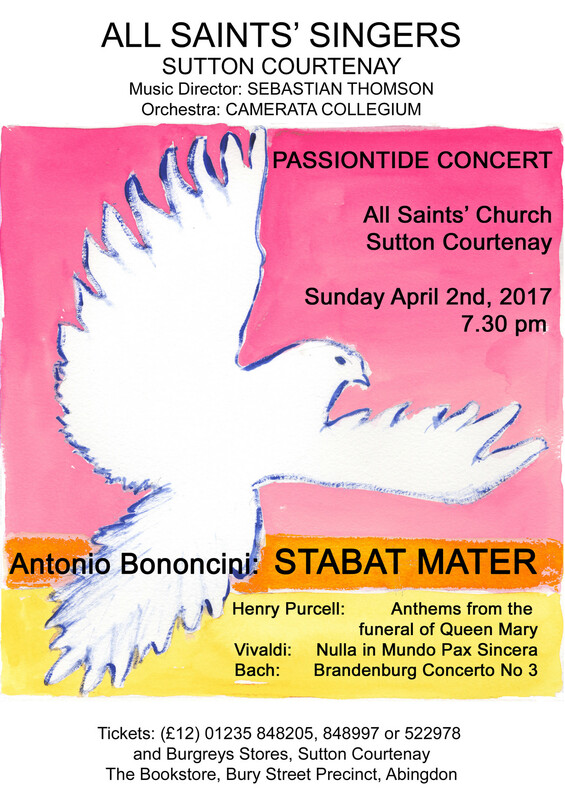 Well, the “Stabat Mater” took me completely by surprise. I enjoyed every moment, the choir giving their all and singing with great sensitivity and direction. All four of your soloists were easy to listen to, nothing forced and a delight to watch. 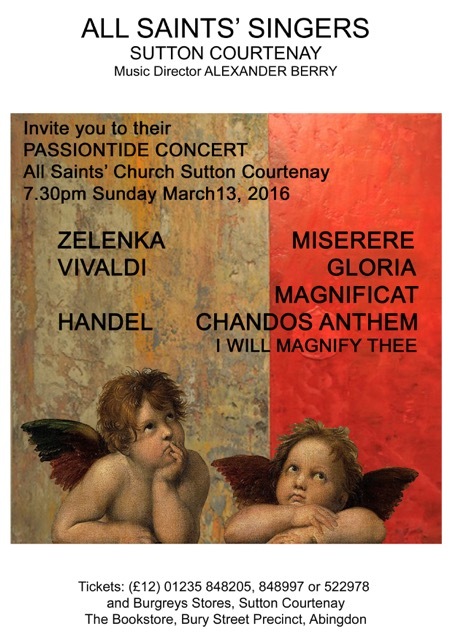 The singing of Clemmie Franks, in two beautiful arias had me spellbound. What a voice! 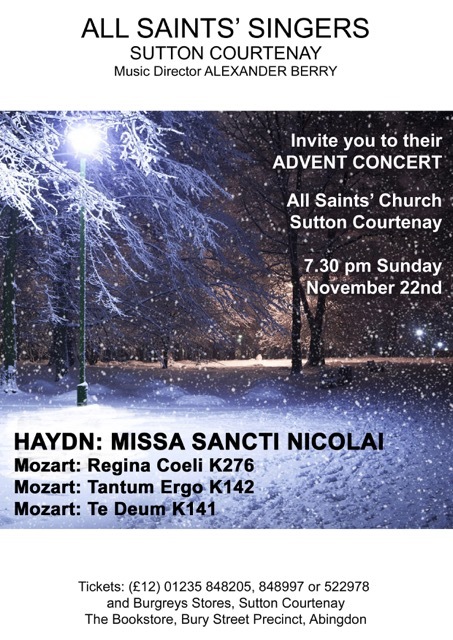 As shown in the poster above, this will be Haydn’s Missa Cellensis Hob. XXII:5 along with Handel’s Zadok the Priest and the concerto grosso in B flat major by William Boyce. 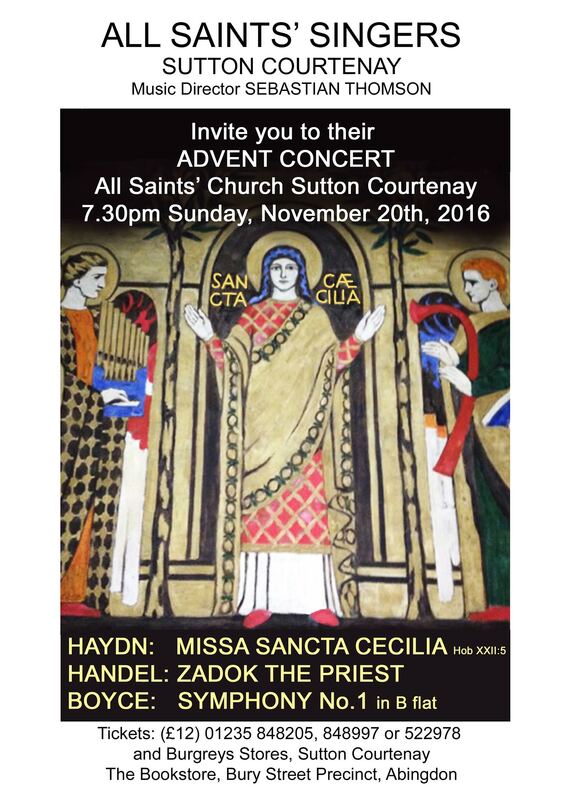 The concert will be Sunday 20th November.